August 23, 2015—The recent mine disaster that resulted in contamination of the Animas River in Colorado and downstream tributaries has lead to much discusson on all levels–what to do with the mines that are leaking contaminants which, in many cases, miners have just walked away from? The EPA didn’t know how much water they were dealing with in the Gold King mine. Why? Being a Coloradan, I have been inundated with news on the subject–from national news and articles to extensive speeches by Govenor Hickenlooper and representatives from other states effected by the spill. So why haven’t the mines been cleaned up? Why are such big mistakes made from lack of knowledge about the mines? Mines use water for processing the minerals being extracted. The mill water was used to crush and grind the ore, with much of the minerals and metals being desolved in the water. Waters used to process the minerals often contain chemicals and the resulting leachate water, which has trickled through solid mine waste, may contain an excess of metals, minerals and chemicals. Miners walked away from mines after striking it rich or going bust. A study in 2011 showed that mining of metals accounts for about 40% of the 1.9 billion pounds of toxins released into air, water and land. Often the state regulaters may not be aware of leakage from these mines until local residents start complaining about the color of their drinking water or the dead fish rising to the surface of nearby streams. 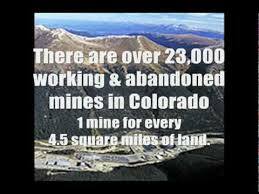 In Colorado there are an estimated 23,000 abandoned mines, and at least 230 abandon mines are known to leak metals such as cadmium, copper, lead, arsenic, manganese, zinc and contaminates at a rate many times above the safe level. The combined results of the current mine leakage may be as much as the Gold King mine, or 3 million gallons every other day, effecting nearly 2000 miles of rivers and streams. Mines are often high in the mountains and difficult to get to. The EPA has estimated there are half a million abandoned mines in the Western U.S., with an estimated $50-$75 billion needed to clean them up, and the cleanup for many mines will take years. Many of the mines date back to the 1800’s when the prospectors walked away from their mines after extracting the sought after metal. Their only thoughts were of striking it rich.They had no environmental concerns of contamination of groundwater or restoration of the land. 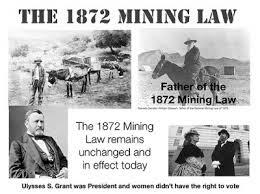 Laws were not enforced the first 125 years of mining. Until the Gold King disaster in August 2015, the leakages of most mines have not been tracked. Along with lack of awareness of their effects until complaints are filed, the clean-ups have been “hampered by a chronic lack of resources, political battles and engineering challenges.” Congress has not required any sort of remediation payments for the hardrock mines, but since 1977 coal mines have been required to pay per ton of coal for clean up. The Mining Law of 1872 still applies. This brings us to the General Mining Act of 1872, which states that, “All citizens of the U.S. 18 yrs of age and older have the right to locate a lode (hard rock) on federal lands open to mineral entry.” It was an attempt by the U.S. government to populate and settle the West, opening federally owned land to the public that hadn’t been set aside for other uses. The price of the mining claim was set at $2.50 to $5.00 an acre and has not changed since 1872, except to require a $100 holding fee and to exclude coal and oil from the Act in the 1920’s. Approximately $230 billion of minerals have been mined since this act passed. Many bills have been introduced to change the Mining Act of 1872, but miners have fought against them and they’ve been dropped. In 1980 a U.S. Federal law called the Superfund was passed to clean up sites contaminated with hazardous materials, pollutants and contaminants and also giving rights to Federal and state agencies, and Native Americans to recover damages from hardrock mines, but, the Superfunds have rapidly dwindled due to the expiration of the corporate tax that supported it. The Superfund was intended to cleanup sites when the responsible parties are unable or can’t be found or the miners have walked away, declaring bankruptcy and tranferring their assets to a corporation with a different name controlled by the same people. In May 2015, Earthworks and other environmental groups brought a lawsuit against the EPA stating, “The EPA has unreasonably delayed issuing financial assurance rules and seeks an order for the EPA to finalize rules by January 2016.” They petitioned the court of appeals for a Writ of Mandamus that would require the EPA to issue rules that make industries cleanup when handling hazardous waste. In an article by Jeremy P. Jacobs, May 12, 2015, he stated, ” Environmentalist are asking the U.S. Court of Appeals to force the EPA to put the law into effect so that financial assurance regulations are required by the 1980 Superfund clean up program.” He also stated, “The Federal judges lost all patience with the EPA when considering why it has taken more than 30 years to fulfill a congressional mandate requiring large industries like hardrock mining to assure the EPA they can cover the cost of cleaning up their pollution.” A financial guarantee, in the form of trust funds or bonds from the miner would be established before mining on public or nonpublic lands and would assure the EPA and the public that reclamation and cleanup would be financially feasible if the company is not able or willing to pay when the mine is closed. If this is not enforced, the taxpayer ends up paying for the cleanup. Another possibility for clean up is H.R.963-Hardrock Mining Reform and Reclamation act of 2015. It encourages remediation of inactive and abandoned mine sites by good Samaritans, (individuals or entities who had no role in the creation of the historic mine residue or resulting environmental pollution and are not legally responsible for the remediation of the historic mine residue.) This is important because, in the past, individuals and conservation groups were not willing to take on the cleanup without liability protection from the Clean Water Act, as they would be left responsible for water quality while working on the site. And Why Aren’t They Cleaned Up Yet? So these are just some of the complexities of what seems like a no brainer–just clean them up! Time, money, laws or lack of, loopholes, lack of organization and responsibility, liabilities and just plain blunders have hampered the cleanup and led to the huge mistakes like the Gold King Mine incident which dumped millions of gallons of pollution into our waterways. To support the cleanup of these mines let your voices be heard!